Every two years, the Society for Marine Mammalogy hosts a conference. Over 2,000 scientists that study whales, dolphins, seals, sea lions, sea otters and polar bears descend on whichever city holds the conference. The last conference I attended was in Quebec City, Canada, where I presented results on male sperm whales that matched between the Azores and Norway. This year, I was presenting a poster on twelve female sperm whales and a calf that have been seen in both the Azores and the Canaries, as well as a match between the Azores and Madeira and also a single match between Madeira and the Canaries. I was also co-author on two other posters, one on humpback whales and the other on blue whale photo-identification. The conference gives people studying marine mammals around the world a chance to see what is being done elsewhere in the world. There is not a lot of time to rest. There are five talks going on at the same time for most of the day and a couple of selected speakers have their own slot. This year saw the introduction of the 5 minute speed talk, which was challenging for both the presenters and the listeners, especially if the audience wanted to change rooms for the next talk! On Saturday, before the official start of the conference, there was a workshop just on sperm whales. We had short presentations on all aspects of sperm whale biology & behaviour. I gave a short three minute presentation on the photo-identification work that Biosphere Expeditions and I are doing in the Azores. There is not a lot of genetic diversity between oceans, and this may be due to a bottleneck in the population around 80,000 years ago, when the squid populations also crashed. Male sperm whales in Alaska have learned how to take sable fish off the long lines. It seems that there are around ten offenders and the researchers are working on ways to help the fishermen avoid this loss or these whales specifically. Some of the males were tagged with satellite transmitters and a few of them went as far south as Baja, Mexico still heading south when the transmissions stopped. Russian illegal whaling may have changed the structural groups of females in the Pacific by decimating the stocks. Females in the Pacific groups are not always related, whereas in the Atlantic they generally are. This was caused by individuals forming new groups in the Pacific. There are some juvenile male sperm whales that lived close to a navy test site in the Bahamas for a couple of years, before they moved on to another unknown destination. I am hoping to get those flukes for matching to the Azores catalogue. The female sperm whales in the Bahamas sensibly stay in the north of the archipelago, away from the navy test site and there does not appear to be mixing between the groups seen in the Bahamas and Dominica. A couple of invited squid biologists gave us a bit of a different perspective on the whales as ferocious squid predators. And in the last presentation of the day, it was shown that the theory that sperm whales change the density of the spermaceti to help them dive and surface is not accurate. Whales benefit the environment by recycling nutrients. In the case of sperm whales they catch their prey in deep waters, but defecate at the surface, re-releasing all those nutrients, which would otherwise be lost to the depths. Blue whales in the Antarctic drive the whole ecosystem by recycling nutrients and making them more accessible for the krill to use. Climate change is not good news for polar bears and probably walrus too, because they depend on the sea ice to hunt, but grey whales could benefit as new feeding grounds open up, which have previously been covered in ice. This lack of ice could also lead to grey whales re-populating the Atlantic Ocean, where they have been extinct for many years. But the fossil record shows that there may have been several re-colonisations over the years as ice ages came and went. Fin whales are mostly right handed lungers. Out of 800 lunges, only three or four went to the left. A long term photo-ID study in Alaska’s Glacier Bay National Park has 46 individuals with a sighting history of more than 30 years. Something I am aiming for with the Azores sperm whales. And speaking of Humpback Whale IDs. There has been a match made between a humpback whale that was seen during the 2008 Azores expedition and then again in Norway in 2012, near Tromsø! This is the second match made with a whale actually seen during an expedition. The other match was first seen in Norway on 20 March 2010 and then in the Azores on 5 May 2010. The humpback whales that we see in the Azores are most likely travelling from the Cape Verde Islands up to feeding grounds around Iceland and Norway or back down to the breeding grounds; although to date we have not had any matches to Iceland. We have eight Azores matches to the Cape Verdes and now eight matches to Norway as well. The whales can use the waters around the Azores as a pit stop from the breeding to feeding grounds, since most of them have not been feeding for a few months while on the breeding grounds. So far we have not had any matches to the Caribbean population of humpbacks, which is more numerous than the Cape Verde population, although this may be down to low numbers of identifications in the Azores. The flukes in the North Atlantic Humpback Whale Catalogue are constantly being reviewed, especially with hard to match individuals, since the computer assisted matching is not always perfect. And speaking of computer-assisted matching, I think we will be trialling a new matching system, Flukebook, during the 2016 expedition alongside Europhlukes. Flukebook is a new online matching system that shows a lot of promise. It uses six different algorithms for the matching and has machine learning too, as well as being able to plot the sightings with Google Earth. The biggest drawback will be if catalogues that I currently match to, do not join Flukebook. Only time will tell. After the conference I had a couple of days down in Monterey Bay, looking for grey whales, since I had never seen one. The mission was a success, I saw over 20 different grey whales and around 30 humpbacks. Unfortunately none of the “friendly” behaviour from the greys – they were just migrating on their way to the breeding lagoons, where you can get the “friendlies”. No acrobatics from the humpback whales either, but I did get some fluke ID pics, which I will send off to the Pacific Humpback Whale Catalogue at Cascadia Research. 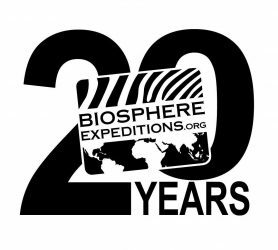 I would like to thank the Friends of Biosphere Expeditions, as well as my parents, for making my attendance at these conferences possible through their support. And thank you to all the expedition participants that make this work possible. Information on cetacean sightings collected by Biosphere Expeditions’ citizen science volunteers in the Azores are confirming the importance of this region for a variety of species, amongst them humpback, sperm and blue whales – the largest species ever to exist on our planet. Recent data have highlighted the importance of ‘site fidelity’ (the same individuals returning to the same location again and again) for species such as sperm whales. 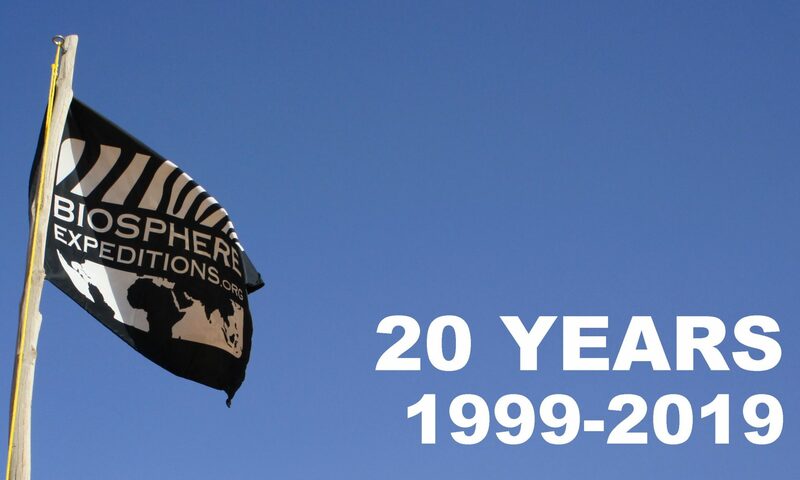 Indeed some individuals have been recorded multiple times since 2004, when Biosphere Expeditions first collaborated with Whale Watch Azores on this long-term project. But the decade-long data collection has not only revealed patterns of the lives of whales and dolphins around the Azores. Fluke identifications have been matched with individuals recorded further afield, such as in Norway. The project supports initiatives with both the University of the Azores and University of Florida, resulting in multiple novel scientific publications on the marine life of this unique archipelago. Sunday was finally a sunny day with calm seas and almost no wind. The first time this week! The lookout on Pico Island had spotted some blows of sperm whales in the south. So accompanied by a school of common dolphins, we headed out. Pico’s summit was cloudless and gave a beautiful background to the calm sea. The sperm whales surprised us and kept us busy the whole day counting their blow rates, taking ID photographs of their flukes and milling around while waiting for them to resurface after their deep dives – up to 45 minutes. Two beautiful loggerhead turtles were seen, but they dived away before we could even get close to catch them for tagging. Finally Blue Monday and with it the last day of the expedition arrived. I am not about to break into the New Order classic but these two words perfectly summed up the. The first whale of the day was blue, and so was the second, and then the third. By midday it was already a remarkable day. However, three fin whales, at least four sperms whales and three more…yes, three more blue whales followed. Six blues in one day…it was one hell of a finale to the expedition. And the best was saved until last, as our very last sighting was a fluking blue whale. Oh, and I almost forgot to mention the synchronised double fluking sperm whales earlier in the afternoon. This was a fine reward for our team. Patience was tested over the last few days, with difficult sea conditions, challenging weather and sightings not always easy to come by! But today the whale gods smiled on us. After a tense first hour, the sightings just didn’t stop, all day. This is the great thing about expeditions; they will always test you and then reward you in ways you don’t expect. So we ended as we started, with blue whales. Yes this is great data, but also a humbling experience. Sharing the same piece of ocean with the largest creature that has ever graced our planet, can’t fail to stir the emotions. So huge thanks to both teams, our scientist, Lisa, my two assistant leaders (Anthony & Chris) and our skippers (Nuno & Gyro). It has been a great expedition and we look forward to doing it all again next year. It may be the weekend but that is of no relevance to us. We have been back out to sea, and despite the seemingly ever present swell and winds, the team are happiest on the boat (mostly!). Our main pursuit was tracking a couple of sperm whales, who periodically disappeared between the wave sets. Persistence does, however, pay off, and we were rewarded with a double fluke. Our other records of the day were common dolphins. Working on the Azores project gives you a new sense of perspective on your reality, when seeing a couple of sperm whales and some common dolphins seems like a below average day…maybe only in a data collection sense. Our slightly earlier return to the harbour, did give the team a chance to leave their lasting mark on Horta – completing the Biosphere Expeditions harbour painting (started by the first group). It seems tradition that every boat crew coming in or out of this harbour leaves a painting to mark their presence, and every surface is covered by a range of talents! With our art completed, it is back to the science on Sunday. We have been reluctant land lubbers for the past three days but that routine has now been broken. Today we returned to the sea. The weather is not ideal – winds too strong and waves too high. This all makes sighting cetaceans harder than normal. Such are the joys of fieldwork! With our movements restricted to the calmer waters of the channel between the islands of Pico and Faial, the sum of the reward for the day’s efforts was a few encounters with small groups of common dolphins. The conditions did also give us chance to enjoy some of the aerial acrobats, such as the Cory’s shearwaters, who are one of the targets for the bird surveys. Our feathered friends can get over-looked on ‘busier’ days, but they still form an important component of the surveys. So a better than being stranded on land all day day. Birds + dolphins = data, which also means a happy team. We’ll just have to try again tomorrow and hope our perseverance is rewarded. Bad weather has stopped play. High winds, rain and large waves have temporarily halted our progress on the water. Consequently, Tuesday presented the opportunity for most of the team to explore Horta and Faial – by foot, bike, moped and car! On Wednesday, the team were back at the scientific ‘coal face’ sorting data, organising photographs and matching images. The great news is we have ‘matches’. At least four (possibly five) matches of sperm whales, identified from their fluke images taken by slot 1 on the 14th April this year. These individuals were previously recorded on multiple occasions as far back as 2004, when Biosphere Expeditions first worked in the Azores. It is great when all the hard work pays off and you can link the data points collected between the different expeditions. So whilst we would have preferred to celebrate Earth Day out on the water, documenting new encounters with false killer whales, bottlenose dolphins and sperm whales, the team were able to join some data dots and complete another piece of the cetacean puzzle. Our only whale of the day came in the form of a birthday cake for John – Happy Birthday. Blue skies, calm sea…the second day seemed promising. Fears of churning stomachs were replaced with optimism as we took off in search of the cetaceans. The question is would they be more co-operative than on Sunday? With no information from our lookouts, it looked like the flip of a coin would decide where to go. We headed to the south of Faial, where noone was looking. Some common dolphins made a good start, surfing our bow wave. Bob got the chance to do his job with the hydrophone, in the hope to hear some ‘metronomic clicking’, which would lead us to some sperm whales. Unfortunately these toothed whales were silent, but the dolphins were singing. With wind from the southeast, we trailed west and suddenly the shout came: “Bloooowww”. Four fin whales travelling south of Faial were kind enough to show us some of their impressive white lower jaw, blow holes and dorsal fins – identification shots were bagged. Some bottlenose dolphins also gave us a fleeting encounter. The faint clicking of the hydrophone suggested the sperm whales were out there, but our efforts to find them were interrupted when we suddenly ran into a school of 150 striped dolphins, jumping and racing along. Not a common sight here; and all were happy to be the first Biosphere Expeditions group this year to encounter these beautiful animals. A sperm whale finally revealed its location by breaching with a huge splash in the far distance. Our pursuit was thwarted by rougher seas, but not before being waved goodbye by a sperm whale’s fluke. Random sightings of these mammals are rare, so also capturing the photo ID was a bonus. While closing our circle around the island of Faial we encountered another single fin whale passing to the north. As the wind strengthened, it was time to head for the harbour. The data scores were better than yesterday, with more encounters and species. Our only zero was on the turtle front – the first time the expedition has failed to record one this year. After a whistle-stop weekend of introductions, briefings and training sessions, our new team were probably not expecting fish food and ‘rock ‘n’ roll’, as they set foot onto the Physeter – our research vessel. The whales were playing ‘hard to get’, and the dolphins were a ‘no show’ for whole afternoon at sea. We eventually tracked down two fin whales, whose constant diving made them even harder to locate in the rise and fall of the large swell. As the boat pitched, rocked and rolled, any romantic notions of cetacean watching in calm sun-kissed seas quickly evaporated from the minds of many – replaced with the nauseous reality. Momentary distraction and the highlight of the day came in the form of a captured loggerhead turtle. This sizeable specimen was tagged (in the hope of recording future movements), vital statistics taken and returned to its ocean home. So a tough first day ’at the office’ with cetaceans hard to find, but the silver-lining was the first turtle tagging of this year’s expedition…and the fish also got fed (more than once)! In the meantime an article about our work on the Azores has appeared in a major Portuguese newspaper http://observador.pt/2015/04/19/vida-selvagem-mergulha-nos-acores/ and we hear that supremely dim Pippa Middleton reports having eaten whale meat http://www.wildlifeextra.com/go/news/Pippa-Middleton-whale.html#cr…. So our first slot of 2015 in the Azores has come to an end, and it only seems like yesterday that we started. It is amazing what you can pack into just a few days when you try. We’ve been lucky to encounter four species of dolphin – Risso’s, common, bottlenose and false killer whales. The last three numbered in their hundreds over our five survey days. And as for the whales…. the blue whale was a great way to kick-start the surveys – any day you encounter the largest species that has roamed our planet, has to be a good day. We’ve had breaching humpbacks and sperm whales, and several encounters with the elegant fin whales. The team also broke a record, documenting the highest number of loggerhead turtles by any Biosphere Expeditions team, and we also completed the set with a leatherback turtle record. A great team, all doing a fantastic job, and all the encounters equate to vital data. What more do you want from a week at ‘work’? Safe travels and enjoy a well-earned rest. It was inevitable that it would happen eventually, the last day of our first expedition at sea. The team are now working like a well-oiled machine – arisen, eaten and out the door with time to spare when we arrived at the harbour. We set off with the sea as calm as a pond. Our first encounter of the day was with a couple of pods of common dolphins who kept us busy for half an hour; then over the radio came sightings of blows off yonder. We headed towards the island of Sao Jorge and arrived to see a fin whale, no two fin whales; no, three fin whales – who delivered great dorsal fin shots for our photographers (Lisa & Simon). Though it is always nice to get the ID and artistic shot! We parted ways and headed off to investigate the blows of a potential sperm whale sighting. As I was doing the data sheets today, I can assure you they were indeed, but not just one – there were 23 sperm whale encounters and up to 43 individuals including calves! The day was rounded off with seven female sperm whales in a line, side by side when an enormous male came into view and made himself known. Some of the females disappeared and one of them breached out of the water causing a tremendous splash before the male and the remaining females dropped below the surface. We could not have hoped for a better ending to the day and the first group of 2015.